The concept of time is a very difficult one to grasp - one of the reasons, I’m sure, that we’re fascinated by tales of time travelling. There are all kinds of time. There’s a time to get up in the morning, and a time to go to bed. There’s a time, as the world-weary writer of Ecclesiastes reminds us, for everything. But what is time? How do we define it? How can we picture it? Some people say time is in a line. 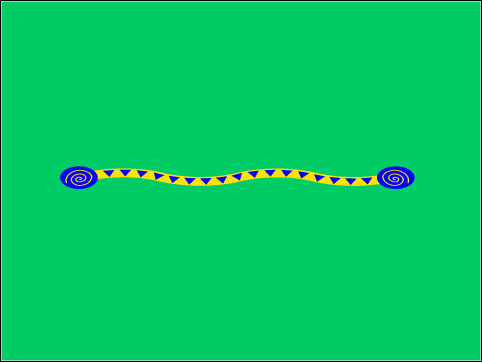 Time in a line. It has a beginning - the newest part. It’s just being born; it is brand new. It’s now and it’s sometimes so close to us we can’t see it. Sometimes we even forget to experience it because we’re either walking with our heads turned over our shoulder looking back, or peering forwards into the mists of the future with our hand shielding our eyes. As time moves on, the part that was new is now getting old. We have a beginning that is like an ending and an ending that is like a beginning. Our Christian church has tied the ending that was like a beginning to the beginning that was like an ending. Like the seasons of the year, which slip together into an endless cycle of death, new shoots, life coming to fruition, only to die back just as it reaches its full maturity, to sleep the sleep of the winter death, ready for spring again. 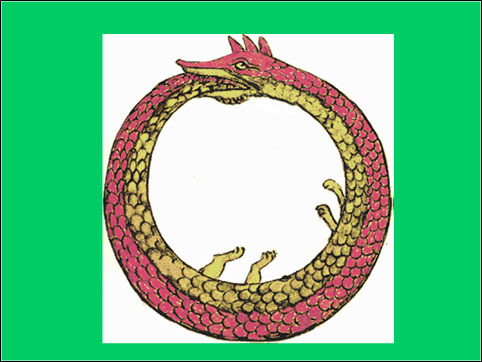 This repetition of the mystery of life’s cycle is echoed in the church’s year. And in the colours we use on the lectern frontal; in the covers for the chalice and patten on the table; and in the vestments the priest wears, we are reminded of where we are in the circle of the church’s year. And so, let’s take some time out to think about the Church’s Year. Before even the first writings of the New Testament were set down, the first great festival that was honoured by the early Christian church was their remembrance of what happened on the day after the Sabbath. For Jews, the first day of the week (1 Corinthians 16:2), became, for the new followers of the way, the eighth day, and the day on which they met together to break bread and remember the Lord’s resurrection - the day that new light dawned. On the first day, God said: Let there be light. And there was light. And God saw that the light was good. And there was evening and there was morning, the first day. We recall the miracle of creation and of new creation in Christ Jesus every Sunday. 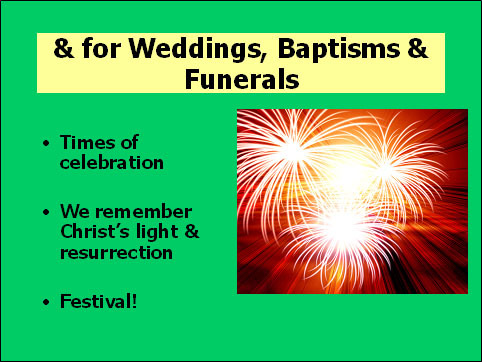 The placing of that great remembrance into an annual celebration of Easter didn’t really take place for many years, but it was the first annual festival to be consolidated. 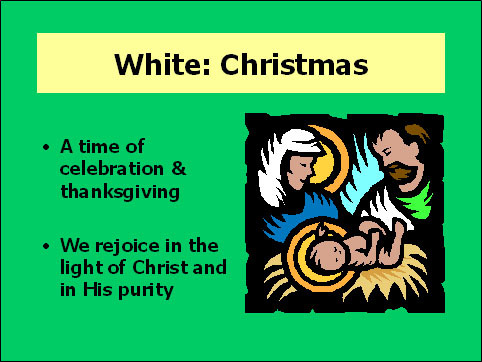 Our first great marker in the Christian circle, then, is Easter - white, or white and gold for celebration, for purity, for new life. And gradually over a period of about 4 centuries, the entire story came to be commemorated in Holy Week and in the glorious 50 days from Easter to Pentecost. Pentecost being the second great festival to appear in the Christian calendar - celebrated in red for the fire of the Holy Spirit and originally joined with the remembrance of the Ascension. Epiphany, and only after Epiphany, Christmas, are not recorded as festivals before the middle of the 3rd century in the East, and not until the 4th/5th centuries in the West, and continued for many centuries to be quite controversial festivals, very much secondary to Easter. However, now, of course, they rival Easter and our white and gold colours remind us of Christ the light of the world, and symbolise the purity and innocence of a newborn. The white or white and gold are also now used for celebrations of many different sorts - for weddings, for baptisms and sometimes also for funerals to remind us of the promise of the resurrection. 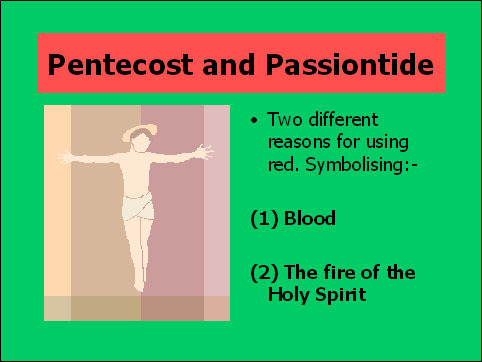 The red of Pentecost is sometimes differentiated from the red of the Passion and for commemorating martyrs. A lighter red for the burning heart of the glowing fire, a darker red for the blood of Christ and of those martyred in the faith. 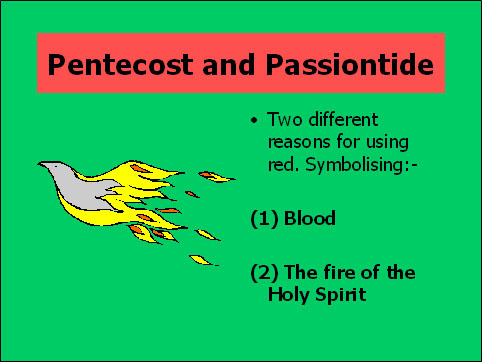 Is yours a Passiontide red, focused on the sacrifice and the pain that was offered for us; or a Pentecost red burning bright within you as the Spirit inspires and enlightens you? 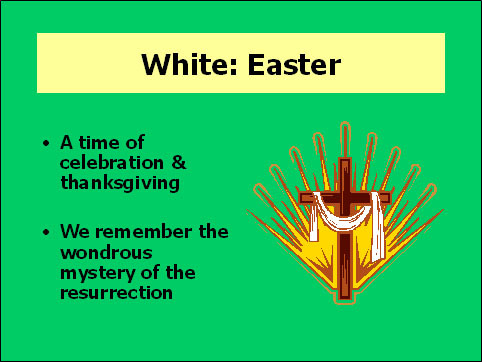 The periods before the two great festivals of Easter and Christmas came to be times of preparation - times to get ready to come close to the mysteries. The time for getting ready to come close to the mystery of Christmas is, of course, Advent (a relative late-comer in the seasons, not firmed up on until around 5th century), and stems from a decree in Spain that no-one should be absent from church between December 17th and January 6th. 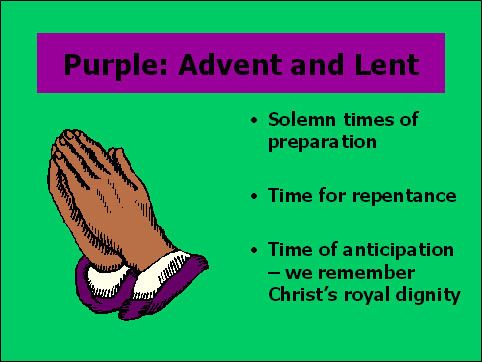 Lent has its origins both in the commemoration of Christ’s preparation for ministry in the desert, and, later, in the preparation of those who were to be baptised at Easter - at one time, the only time of year for baptisms. Some churches use sackcloth as the colour for Lent to remind us of our need for penance. I much prefer the sombre richness of purple. 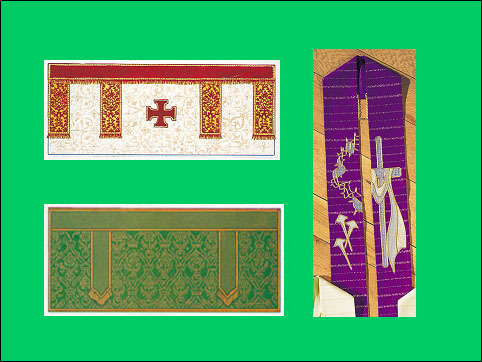 Our purple hangings and vestments are the purple of royalty - we are reminded of Christ’s kingship, but we also remember that the only time he wore purple was when he was being mocked by the soldiers before his crucifixion. It is of course the supreme irony that Christ - the ultimate king - was mocked by being forced to wear the colour he was uniquely qualified to wear. He endured disrespect and ridicule in humility, and I think the call for Lenten humility is much better served by that reminder than by remembering the people who have tortured themselves and others in the name of faith in sackcloth and hair shirts. Advent, too, can be celebrated in blue, as the season for reminding ourselves of Mary’s role in the great story, but more commonly we use purple again as the preparation for celebrating the arrival of our infant king. The time of preparation of Christmas is far shorter than that for Easter. We are reminded that Easter is the greater mystery for which we need much preparation. And the white and gold of the Easter season spills over for six weeks - it’s such a great mystery it can’t be contained in just four weeks like Epiphany. Easter just keeps on going - because during that time people just kept on meeting Jesus. Somehow he was still with them, as he is still with us, until the mystery grew greater still as he ascended before them and then the Spirit came and the church was born. But life can’t all be carnival. It’s great to celebrate and have fun in the white and gold and red days - but it would be a bit like having nothing but jelly and ice cream at every meal if that’s all there was. 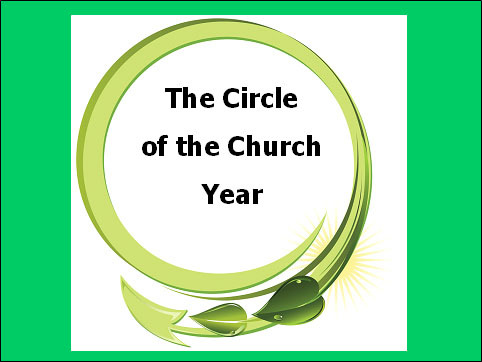 And so the church spends much of its circle in green. 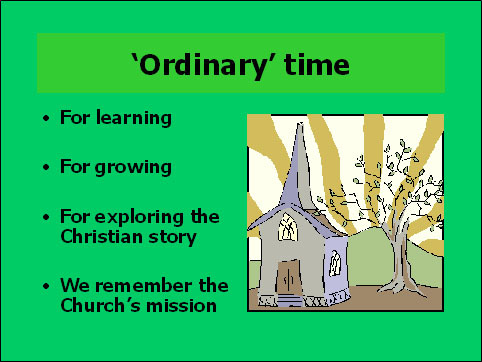 In the great, green growing days - Ordinary time. In these we learn, we grow, we listen to stories of what Christ did and said and was for us. We hear about his life, his teaching and his mission - and we learn about our own role in all of this. 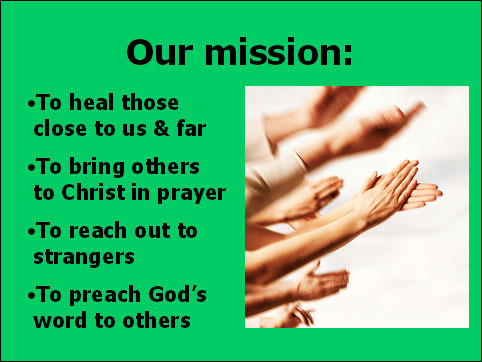 We focus on the church’s mission in the world. This green and growing time is the time for hard work - for us to discover what God is calling us to do for him in the world. We hear stories about Jesus and how he carried out his mission. Christ’s example tells us to reach out, to heal and preach - not just to those with whom we feel comfortable and at home, but to those elsewhere, and who are different. There are so many ways of being part of God’s great mission. We won’t all be suited to each - we all have different gifts - but we are all called to take our part - never simply to be bystanders, passive recipients - our faith must be active in the world or it dies within us. Don’t get too comfortable with your faith - God will be calling you onward and outward - to do and be something new in the world. In the green and growing time, we can listen hard for that call, discover what our mission is - and then get out there and do it.